Dr. Christina Gojmerac obtained her Ph.D. in Psychology from the University of Toronto. In addition to providing clinical supervision and clinical services at our practice, she works full-time as a neuropsychologist at St. Joseph’s Healthcare Hamilton in the Seniors Mental Health Program and the Clinical Neuropsychology Service. 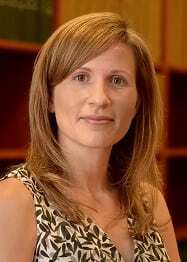 She also holds an appointment of Assistant Professor in the Psychiatry and Behavioural Neurosciences Department at McMaster University. Her previous clinical positions have include both predoctoral and postdoctoral psychology positions at Baycrest Health Sciences. Dr. Gojmerac’s clinical and research interests are in aging, cognition, and mental health. Her primary areas of practice include neurocognitive assessment and cognitive rehabilitation of adults and seniors. She has experience with a broad range of clients, including those with neurological conditions (e.g., acquired brain injury, dementia, stroke, Parkinson’s disease, multiple sclerosis) and those with psychiatric conditions (e.g., depression, anxiety, bipolar disorder, schizophrenia). Current research projects include a randomized control trial to investigate the effectiveness of a multi-factorial intervention program in seniors experiencing cognitive impairment, and a program evaluation of a memory intervention program for adults with mood disorders. King, J.P., Gojmerac, C.B., & McNeely, H.E. (2015). Psychological Assessment of Borderline Personality Disorder in Geriatric Patients. In A. Hategan, J.A. Bourgeois, & G.L. Xiong (Eds. ), Borderline Personality Disorder in Older Adults: Emphasis on Care in Institutional Settings (pp. 51-58), Nova Science Publishers, Inc.
Waserman, Saperson, Gojmerac, and Stanzlik-Elliot (2015). Suicidality in Geriatric Borderline Personality Disorder: Clinical Approaches and Management. In A. Hategan, J.A. Bourgeois, & G.L. Xiong (Eds. ), Borderline Personality Disorder in Older Adults: Emphasis on Care in Institutional Settings (pp. 71-80), Nova Science Publishers, Inc.
Wiegand, M.A., Troyer, A.K., Gojmerac, C., & Murphy, K.J. (2013) Facilitating change inhealth-related behaviors and intentions: a randomized controlled trial of a multidimensional memory program for older adults. Aging and Mental Health, 17(7), 806-815. Ishii, R., Gojmerac, C., Stuss, D., Gallup, G.G.Jr, Alexander, M.P., Chau, W., & Christo, P. (2004). MEG Analysis of “Theory of Mind” in Emotional Vignettes Comprehension. Neurology and Clinical Neurophysiology, 28, 1-5. Dixon, M.J., Desmarais, G., Gojmerac, C., Schweizer, T.A., & Bub, D. (2002). The role of premorbid expertise on object identification in a patient with category-specific visual agnosia. Cognitive Neuropsychology, 19(5), 401-419.